Comet Pan-STARRS or PANSTARRS: What's In a Celestial Name? Astrophotographer Adam Block of the Mt. Lemmon SkyCenter took this photo of Comet Pan-STARRS (C/2011 L4) over Tucson, AZ, on March 10, 2013. 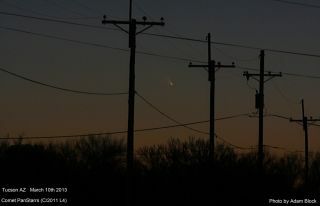 What's the name of the bright comet currently visible in the western sky at sunset? Look around the Internet and you'll find many different names for Comet Pan-STARRS, which is visible in the twilight sky of the Northern Hemisphere this week, weather permitting. Some NASA statements refer to the comet as PANSTARRS, while others use the object's official designation C/2011 LR (PANSTARRS). The location of Comet Pan-STARRS low in the western horizon in March 2013 is shown in this sky map released by StarDate Magazine, a publication of the McDonald Observatory at the University of Texas. The official body that governs the names of everything astronomical is the International Astronomical Union. Remember them? They are the people who reclassified Pluto a dwarf planet in 2006.While observing the comet may seem straightforward, the specifics of its name are a bit more complicated. 1) "A prefix, alluding to the type of comet, that can be any of the following- P/ for a periodic comet. - C/ for a comet that is not periodic. - X/ for a comet for which a meaningful orbit cannot be computed. - D/ for a periodic comet that no longer exists or is deemed to have disappeared. - An uppercase letter identifying the half-month of observation during that year (A for first half of January, B for second half and so on). - A number representing the order of discovery within that half month. 3) When a periodic comet is observed after its second apparition, the IAU’s Minor Planet Center (MPC) gives it a permanent number indicating the order of the discovery. 4) To complete the designation a comet is given the name of its two first discoverers (last name for an individual or one word or acronym for a team of astronomers). The names appear in chronological order and are separated by a hyphen. In very rare cases the title can consist of three discoverers, or even be generic." If you had X-ray vision and could see the names attached to the comets currently in the evening sky, you'd see the vast variety of names that are possible. Most people are surprised at just how many comets are actually in the sky at any given time. Most of these are too faint to be seen except by large telescopes. When the comet currently gracing our western sky was discovered in late June 2011, the CBAT gave it the name "C/2011 L4 (PANSTARRS)." Close-up of comet C/2011 L4 PANSTARRS as seen from Mount Dale, Western Australia. There are no problems with the first part of the name, "C/2011 L4." The disagreements come with the name in parentheses. Because it was discovered by the members of a project as a group, the CBAT used the acronym of the group. The group's name is a mouthful: the Panoramic Survey Telescope & Rapid Response System. On their website and in their logo, they use the acronym "Pan-STARRS." Wikipedia uses Pan-STARRS to refer to the project, but PANSTARRS to refer to the comet, and this is probably the most correct. Do a search for "panstarrs" on NASA's webpage, and you find three different spellings in the first five hits: the two above plus "PanSTARRS" without the hyphen. I've even seen it spelled "PanSTARRs," which is obviously wrong. The problem with a hyphen in "Pan-STARRS" is that hyphens are used in comet names very specifically to indicate that a comet has two discoverers. For example, Comet C/1995 O1 (Hale-Bopp) was named thus to indicate its co-discovery by Alan Hale and Thomas Bopp. Comet C/2011 L4 (PANSTARRS) is just one of many comets currently in the evening twilight sky. Most are too faint to be seen except in large telescopes, but each is named according to the IAU's system. No matter how you spell it, the Pan-STARRS project is a "discovery machine." Its entire purpose is to discover asteroids and comets, and it's doing so very efficiently. Just look at all the comets named for Pan-STARRS in the related sky map to this story. Whatever name it goes by, it's a lovely comet, and worth a look. Editor's note: If you snap an amazing photo of Comet Pan-STARRS, or any other celestial object, and you'd like to share it for a possible story or image gallery, please send images and comments, including location information, to Managing Editor Tariq Malik at spacephotos@space.com. This article was provided to SPACE.com by Starry Night Education, the leader in space science curriculum solutions. Follow Starry Night on Twitter @StarryNightEdu. Follow us @Spacedotcom, Facebook or Google+. Original article on SPACE.com.